The Kaufmann family from Dresden (see the lower image), Saxony (Johann Gottfried Kaufmann (1751-1818), his son Johann Friedrich Kaufmann (1785–1865), and his grandson Friedrich Theodor Kaufmann (1823–1872), are famous with the construction of several ingenious musical instruments at the beginning of the 19th century—Harmonichord (in 1810, one of the many attempts to fuse the piano and violin), Chordaulodion (in 1810), Belloneon (in 1806, a mechanical musical instrument consisting of twenty-four trumpets and two kettle drums), Acoustic Cabinet, and Trumpet Player automaton (in 1810), which will be explored in this article. The Trumpet Player was made about 1810 by Johann Friedrich Kaufmann. It is certainly one of the most famous androids, survived to our time (it is kept now in the collection of Deutsches Museum, München). The Trumpet Player is a figure of a man, dressed in a Spanish costume, with height approximately 180 cm. It had leather bellows for lungs and reeds, which imitated the sound of a trumpet. It was even able to simultaneously blow two different tones. The mechanism of Trumpet Player is managed by means of two rotatably mounted brass stepped drums. The notches mounted on the drums are in contact with 6 impacting tongues (pins) and four scanning levers, which activate wind valves, that let the air pass by 12 tongues, thus producing a sound, modulated through a trumpet, so it does sound like a trumpet. The stepped drum and the bellows are powered by a spring mechanism (two helical springs) that need to be wound up, by the visible hand crank on the right. 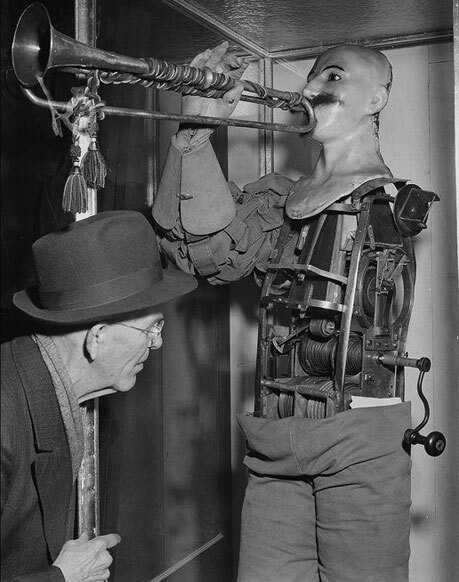 The Trumpet Automaton is a figure not unlike Mario in the "Puritani," with the instrument at its mouth. It was invented many years ago by Herr Kaufmann, and won the admiration of Carl Maria von Weber. What is most remarkable and inconceivable in this extraordinary piece of mechanism, is, that it produces double sounds of equal strength and purity, and flourishes in octaves, tierces, quints, Re., are heard. Perhaps this acoustic curiosity may supply some key to Vivier's wondrous horn effects, certain notes accompanying particular chords. If this discovery should be established, that one instrument can do the same with equal perfection as two instruments, it may lead to something, as natural intonation may surely effect what a piece of machinery can do… To construct such instruments without models, for they are quite original, the maker must be a musician, a mechanic, a mathematician, and a philosopher. The Trumpet Player of Friedrich Kauffman (back view). 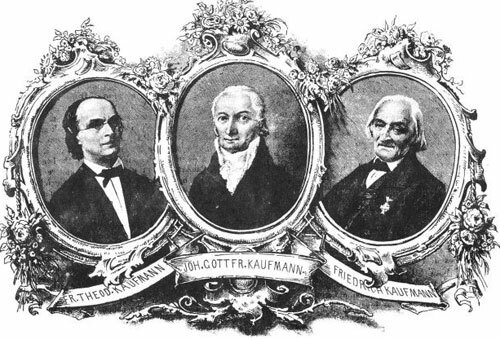 Messrs. Kaufmann, senior and junior, of Dresden, have exhibited four instruments composing an orchestra, which they call the Belloneon, the Cordelauidion, the Automaton Trumpeter, and the Harmonicord. The upper part of the Belloneon exhibits a trophy of arms, in the midst of which are placed twenty-four trumpets reversed: and the lower part encloses two kettle-drums with their sticks. It executes flourishes and marches, with extraordinary perfection. If it contained other wind instruments, it might be compared with Maelzel's Panharmonicon, exhibited some time since in London and Paris. The Cordalaudion produces together and separately the sounds of the piano-forte, and of four flutes, which play with such precision and accuracy, that the illusion is complete. The Automaton gives out notes with double sounds. But these instruments, though highly curious, are surpasses by the Harmonicord. It is shaped like an upright piano-forte; a cylinder is adapted to it, and turns at a very small distance from the springs, which are the same as those of the piano. By pressing down the keys, which embrace four octaves and a half, the friction is effected. Two pedals serves to make the rotation of the cylinder quicker and slower or weaker. Under the hands of Messrs. Kaufmann, this instrument gives out sweeter tones than the Harmonica, and produces a truly celestial harmony. The great composer Carl Maria von Weber was a friend of Friedrich Kaufmann (he met Kaufmanns in 1811 during a demonstration of their instruments). Weber admired Trumpet Player (he called it Trompetenwerk) and in 1812 he wrote an article for Kaufmanns instruments, and a Concertino (Adagio and Rondo) for the Harmonichord with orchestral accompaniment. Johann Friedrich Wilhelm Kaufmann was born on 5 February, 1785, in Dresden, a son of the capable clock maker and instrument maker Johann Gottfried Kaufmann (1751-1818), and a grand grandson of Georg Friedrich Kauffmann (1679-1735), a good Saxon court and cathedral organist and kapellmeister. In 1799 he started his apprenticeship in mechanics as a watchmaker. In 1803-1806 he traveled to Germany, France and Switzerland as a watchmaker assistant, and studied music in Vienna. In 1806 he returned to Dresden, to work together with his father in the construction of musical clocks and invention of new tools. 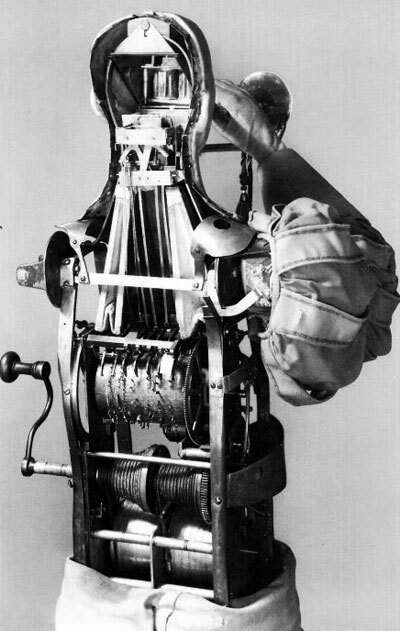 Later Kaumanns made numerous trips in many European cities, demonstrating their 4 instruments: Belloneon, Harmonichord, Chordalaudion and Automaton Trumpeter. 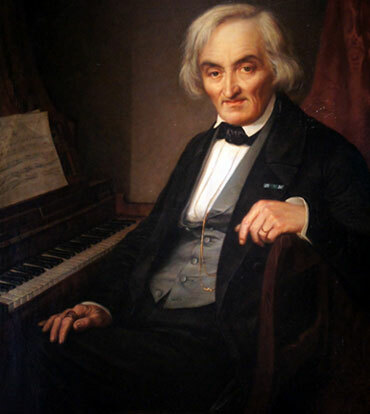 Johann Friedrich Kaufmann died on 1 December, 1866, in Dresden.